I own two meerschaum pipes: an old African block estate pipe and a Turkish bulldog shape my son bought me for Christmas two years ago. Both of these pipes smoke well but they are also both quite large, for my evolving taste anyway, as a result, I don’t smoke either of them very often. So of late I have been on the lookout for a smaller ‘meer that was both affordable and appealing to my eye in local flea markets and antique shops. Most of what I find locally is priced too high, either in general or for my budget, and often they are in poor condition. But a couple of weeks ago I stumbled upon a little pipe that met all of my conditions and it became mine. I took it (and an old Kaywoodie that I’ve yet to touch) home and it waited in my “to do” basket until yesterday. I knew that I wanted to re-clock the stem and also to even out the bigger chips on the bowl and rim. 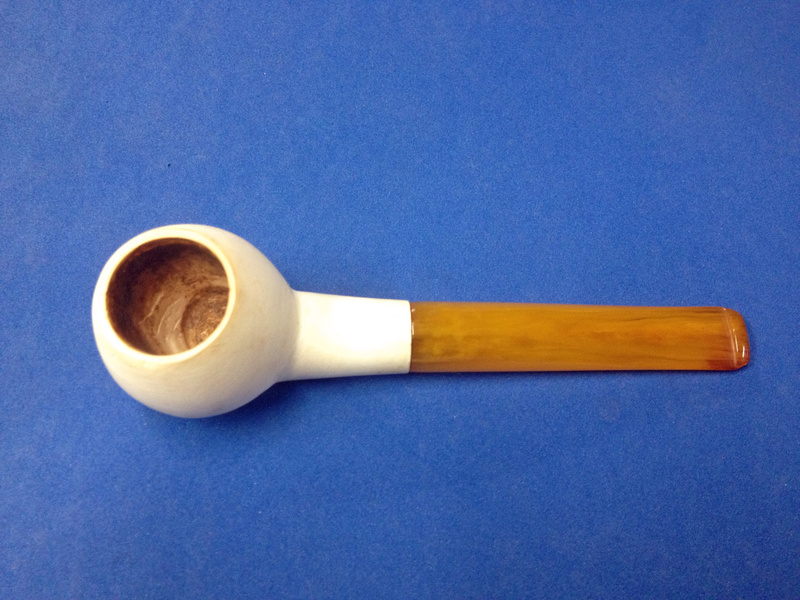 For the chips I remembered Steve’s post on the meerschaum bowl he modified to fit a Kirsten pipe. So I got out some wet/dry paper in about 400 grit and also some well-worn 1000 grit to sand/polish the bowl and rim. after setting the needed paper out, I removed the stem to clean it and the shank well before anything else. 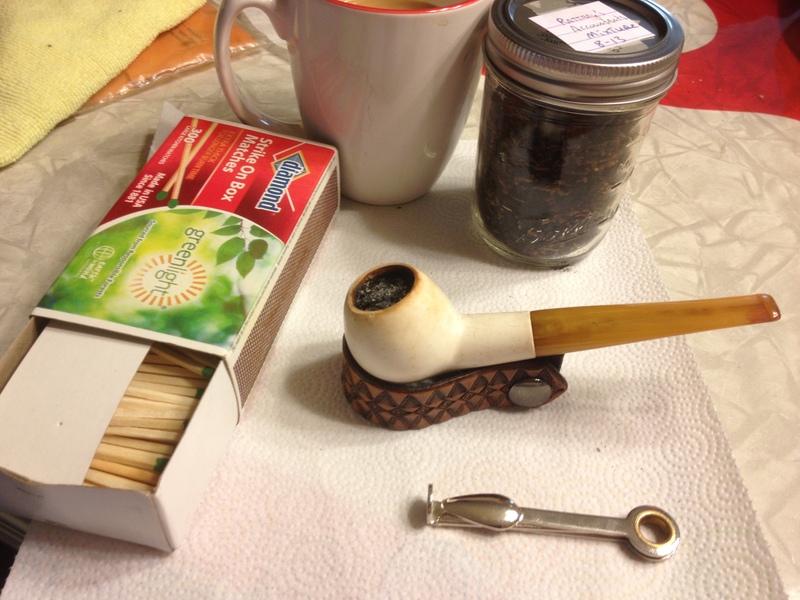 After cleaning and drying everything I reassembled the pipe. I wasn’t able to get it 100% straight but it is better. I tested the draw now and it was open and clean tasting, though the air hole in the stem is not very large. There were, after the cleaning of the stem, some scratches and dings, all small, present. But the shine was pretty good and since I don’t feel comfortable with it I opted to not try to sand/remove them. I may at some point go back and wax it but I’m in no hurry for that. Time to move to the bowl. I began by gently sanding at the deep chips, especially on the bowl. I let it dry out for a few hours and loaded it up with a rubbed out bowl of Peterson Irish flake last night and rubbed beeswax on it as I smoked it. I must say it smokes as well or better than either of my other ‘meers! Unfortunately, I accidentally grabbed up a non-lint free rag to polish it after it had cooled and now have some lint specks in the wax. But I’ll be re-waxing it soon anyway and will fix it then. I also may sand it a bit smoother with 800 grit paper; there are a few scratches still visible but not too irritating to me. This morning I triad a little Rattray’s Accountant’s Mixture in her as I was writing this article and she smoked equally well. This is a look at her after the first wax application. All in all, I’m very pleased with my new no-name ‘meer. She is exactly the size I was hoping for, smokes great, looks pretty good and will look better with time and I got an amber stem that I’d not bargained for! The joys of the hunt and the rewards of the work: That’s why I love bringing these old pipes back to a useful, if not beautiful, state. 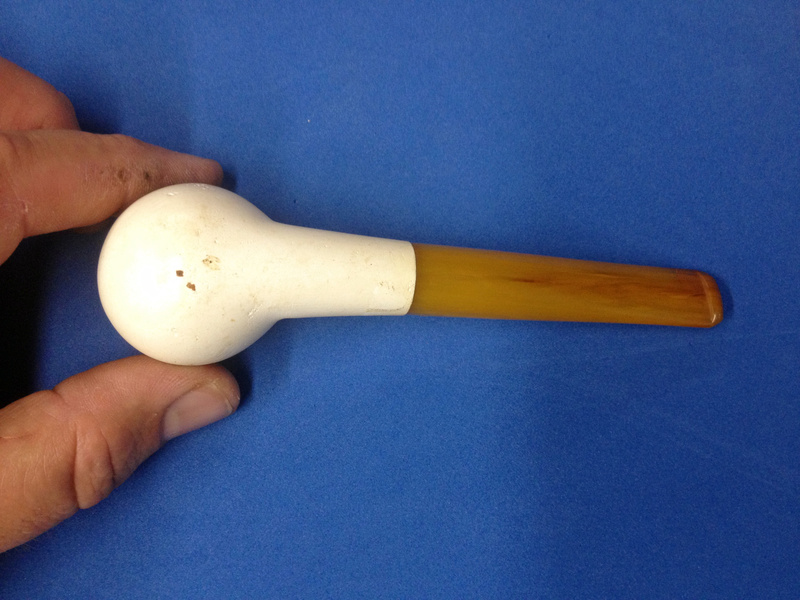 This entry was posted in Examples of Refurbished Pipes, Pipe Refurbishing Essays and tagged amber, Amber stems, Bowl - refinishing, bowl topping, cleaning meerschaums, estate meers, meer, meerschaum, pipe refurbishing, polishing, refurbishing, topping a bowl on September 12, 2013 by Greg. 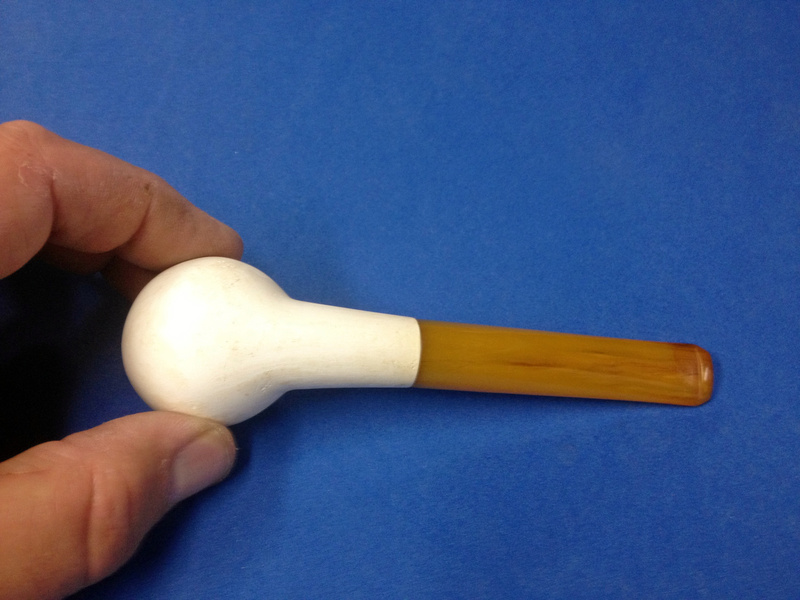 Fred Bass, who is the moderator of the All Things Meerschaum Group on Smokers Forums, wrote this article and has given permission to have it posted on rebornpipes. Thanks to Fred for his continued work in educating many of us to the joy and delight of the meerschaum pipe. 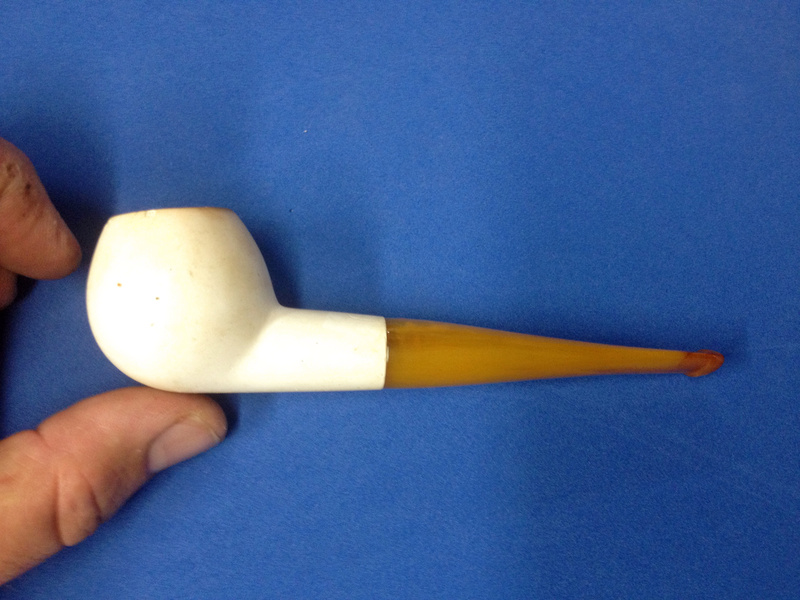 There are an abundance of ideas about how to clean up used meerschaum pipes and return them to active service. Some of these ideas are good while others can generate problems of greater magnitude than those you sought to remedy. I don’t have all the answers and my repair skills are limited by spartan equipment and my lack of finesse with the tools that I do have. Just the same, many of the meerschaums in my collection were smoked by others before I acquired them and cleaned them up, using simple methods to get years of further use from these old soldiers. I’ve written essays and articles on the pleasures of smoking the seasoned meerschaums I’ve acquired, and which I continue to enjoy smoking. 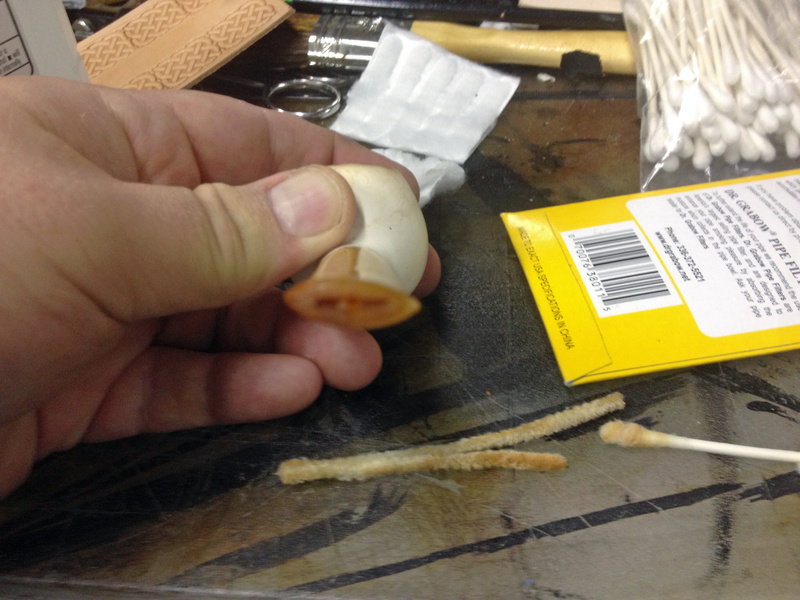 This can be done by anyone who cares to invest a bit of time and patience in acquiring vintage meerschaums to resurrect, and cleaning them up so that they can provide you with years of smoking pleasures as well. I don’t claim to be an expert or an artisan, but using the scraps of knowledge I’ve acquired over the years, as a student and devotee of these pipes and their cultures, has been a benefit to me and it is my pleasure to share what I’ve learned. These are things that I would like to pass along, not as the perfect example that should be followed, since there’s already plenty of that from all of the persona in the pipe community, but as something that I can contribute to the body of available knowledge, while not perpetuating myths and hearsay that are commonly held to be fact. The opinions and preferences of meerschaum pipe smoker are as numerous and diverse as the people who smoke them, and I have no intention to slight or refute them. If you read something in this essay that you think might be useful to you, then I will have achieved my intent to provide you with viable information. I will discuss things to consider prior to purchase of a vintage pipe, which means a pipe that is less than 100 years old, assuming that you don’t already have a pipe that you want to clean up; the basics of removing the debris of past use; routine cleaning to maintain a pipe that will smoke with clarity; and the choices you will need to make about the general appearance of the pipe. I have my own opinions, like everyone else, which you will find throughout this essay, but I will not tell you something that is outside of my experience without giving notice that it either speculation or something someone else has discovered by trial and error. If this sounds like it is something that is worth your time to read, then this is for you. Hopefully, you will find these old veterans of past fires to be as worthwhile as they are to me. 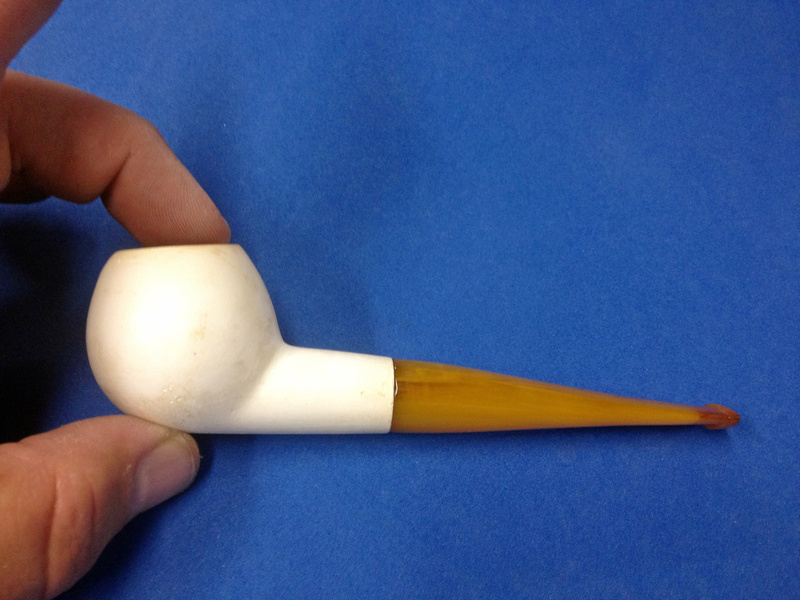 When considering the purchase of a used estate pipe or fixing up a meerschaum that you already have, it is important to get an idea of how much it will cost to fix the pipe, prior to a purchase and/or investing the cash, time and materials that will be required before it can be smoked again. Any good discussion about cleaning up estate pipes should take the value of the pipe and the cost of getting it back in service into consideration, as the two issues are linked to each other, unless you plan to use it for display in its’ current condition. It is best to be able to examine the pipe yourself, which is not always possible since many estate pipes are sold in online auctions. First, determine if there are any cracks, dings or break lines in the block, because if the block isn’t sound, then there is no reason to consider the pipe as being a candidate for future use. Online sellers should be able to provide this information, even if they don’t know a whit about pipes and have poor skills at photography. Reputable sellers are happy to answer your questions. 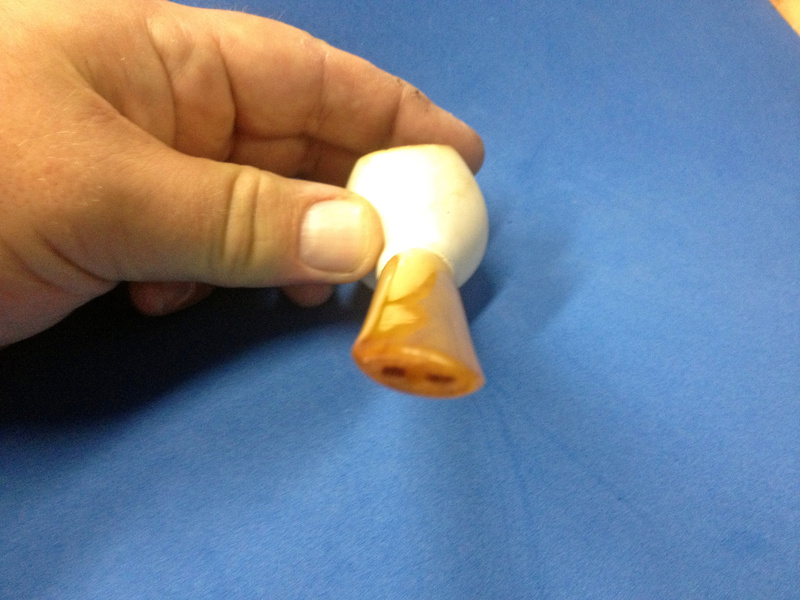 Repairs to damaged block meerschaum are difficult, costly and generally not worth the investment. The presence of a metal band on the distal portion of the shank, where it meets the bit, may be there because of a repair, which is not a good sign for continued block integrity if you intend to smoke the pipe. Metal bands that adorn the pipe for effect don’t present this problem, but it is wise to consider how easy it will be to maintain a bright finish on them without creating problems for the block. Personally, I prefer to avoid having to clean metal on a pipe, especially around the bowl’s plateau, or to have to deal with the metal getting hot while discoloring the block during the smoke. Another aspect of the condition of the block is how much it has been smoked. 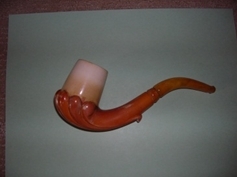 Yes, well developed coloration is attractive but the more use a meerschaum has provided, the greater the possibility of diminished strength in the block’s integrity, especially in the older pipes, which are prone to being brittle. This is more of a consideration for Turkish block than it is for African block, because Turkish block is softer and hasn’t been strengthened by a calcification process, commonly used by factories that produced African block meerschaum pipes. That rich patina might also be there because the previous owner smoked a cheap aromatic blend and never spent a cent on a pipe cleaner, so you could be spending years trying to exorcise the ghosts from the pipe. I’ve been fortunate in that most of the estate pipes I’ve purchased were smoked by someone who enjoyed virginia blends, but the few that I discovered had been used to burn cheap aromatics were a real trial to clean up. 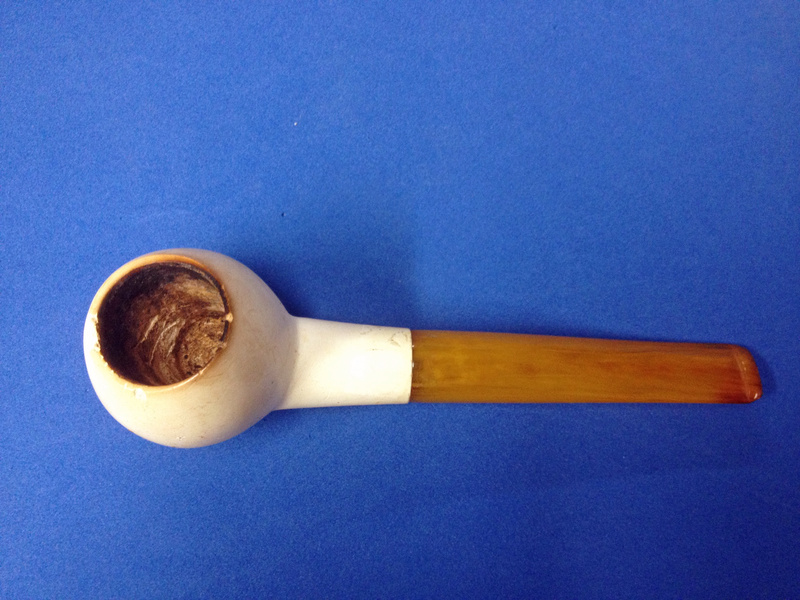 Remember, you can’t use a retort or the salt-alcohol treatment on a meerschaum pipe. I know a few meerschaum pipe smokers that have drilled out the chamber and shank on pipes that have seen decades of abuse and neglect, but I don’t have the skills to do this. Others have used denatured alcohol as a cleaner but I prefer to rely on the FDA standards that Everclear must meet as a food grade solvent. The alcohol concentration is 95% with Everclear and I don’ need to be concerned about what the remaining 5% has in it, which is likely water. You should scrape the cake down to the block and clean the shank with Everclear, a shank brush and plenty of pipe cleaners before the first smoke, but you will need to repeat the cleaning between every smoke until the pipe starts smoking with clarity. Once the block has flushed the debris left by the last guy from burning his blends in it, the pipe will smoke well and it is up to you to keep it clean if you want it to remain smoking with clarity. After you scrape the cake out of the bowl’s chamber, then use a doubled over pipe cleaner with Everclear on it to get more of it out, and a paper towel to ream it. I don’t recommend using a pipe reamer because the force that is required to use one might crack the block. 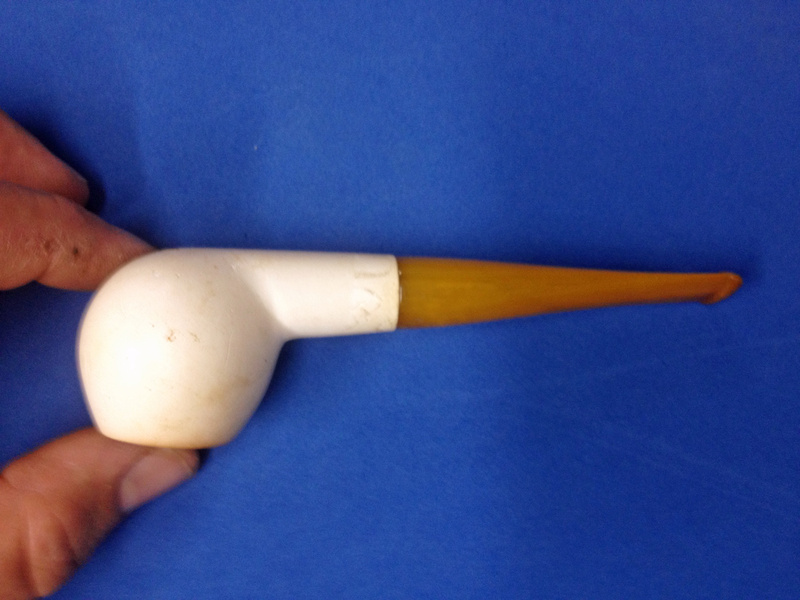 The shank brush with Everclear will help you clean the pipe’s draft, and it might take more than one to do so because a fouled draft can destroy a good number of them before the job is done. When the pipe cleaners start coming back white, then you will know that the pipe is clean. Smoking the pipe will cause more of the trash to migrate out of the block, so be prepared to use a lot more pipe cleaners, shank brushes and Everclear. Some of the abused estate pipes I’ve cleaned up have made a pint of Everclear look like engine sludge with the first cleaning. 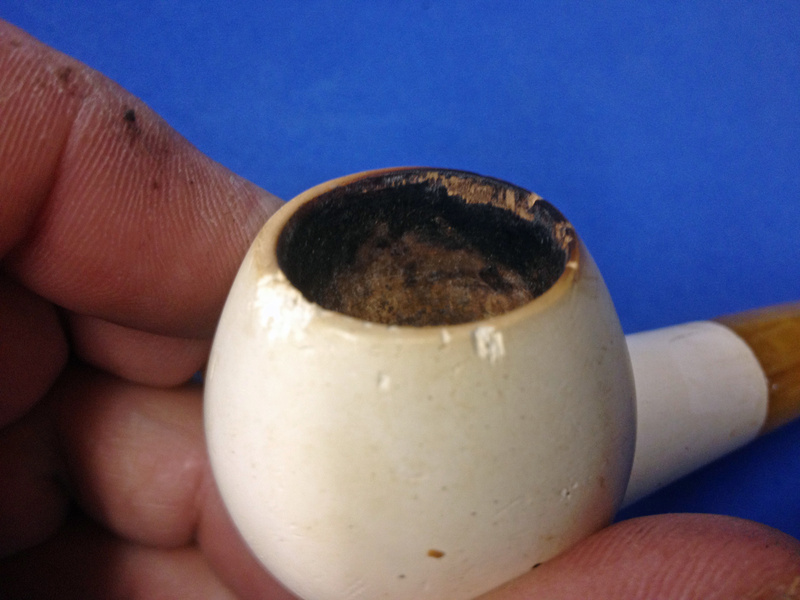 This isn’t the fun part of cleaning these old pipes up, so it deserves your consideration prior to a purchase or a decision to clean up that old meerschaum that’s been in the family for generations. The next thing to consider is the bit and the bit-to-shank connector. I prefer derlin push/pull connectors and bone screws. The Delrin connectors are easily replaced, providing that the threads in the bit and the shank are intact. The bone screw connectors in some of my pipes have lasted for 35 years or more. The downside to them is that they must be kept clean or they can foul the smoke and they can require advance skills in the use of a pipe cleaner. I’ve never been able to appreciate the taste that metal connectors impart to the smoke, so I avoid them. If the bit and the connector need replacing, then either I’ll do it or send it to a pipe repairman if it requires more skills than I have in order to fix them. In the past, I have sanded and refinished bit that were badly oxidized. These days, after discovering that it involved a lot of work, I prefer to just have them replaced if they are in poor condition. There are guys that are happy to work for days on restoring a bit. I’m not one of them. If I can’t clean the bit up using Everclear, a shank brush, pipe cleaners and bit polish, then I send it to Floyd Norwood. If the bit is light colored so that the lumen of the draft is visible, then I’ll use hydrogen peroxide to help remove old stains in the plastic, which is a timely process because I use a shank brush to scrub them in my routine cleaning and do not let the bits soak in the hydrogen peroxide. Get used to the fact that everything about meerschaum pipes is a slow process. 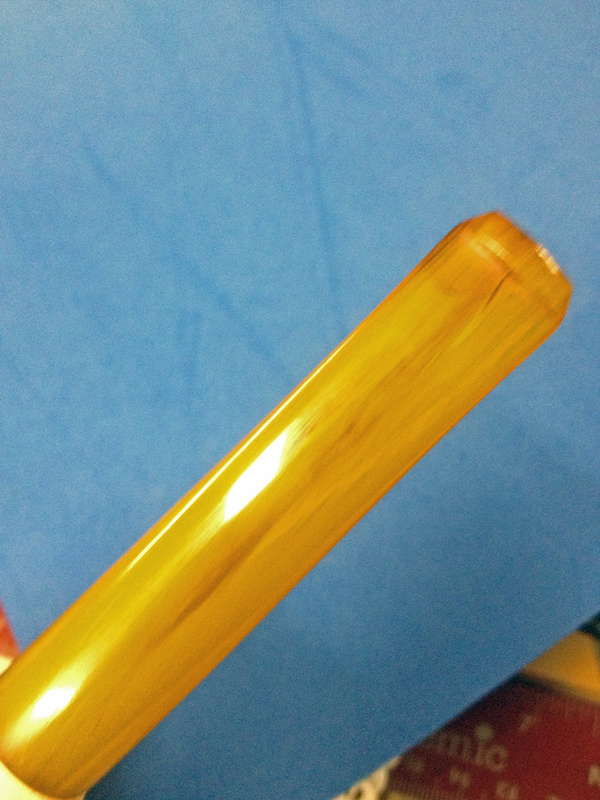 If the pipe has an amber bit with chunks missing, I will have it replaced with and a new acrylic bit. Amber is expensive and many artisans will not work with it. Amber is fragile and the ‘cultured amber’, which is made from the dust and chips left over from cutting and polishing the raw material, is the most fragile. I use regular pipe cleaners, Everclear and bit polish on them. Shank brushes and bristled pipe cleaners should never be used to clean amber bits, as they are brittle and break easily. STEP 1: Use a hair dryer set to hot temperature setting, but low air speed. Heat the beeswax cake to consistency of lip balm. Hold the pipe by the stem. Smear onto the bowl directly from the beeswax cake like lipstick. Do not touch the bowl with your fingers during any of the steps. STEP 2: Continue to heat the section of the surface of the bowl until the wax becomes liquid. Use the cotton swab like a brush to paint the area with a coating of wax. Push (the) molten wax into crevices and hard to access areas. The swab may unravel as it absorbs excess wax. Coat the entire bowl surface evenly. CAUTION: Try to prevent wax from dripping into the tobacco hole since it will leave a bitter taste. STEP 3: Heat the bowl again to allow complete absorption of the wax. Set the pipe down on the towel to cool. STEP 4: After the bowl cools to room temperature. Buff the surface to a high gloss using a towel first then the flannel cloth for the final buffing. If the surface is tacky, too much wax is on the surface. Heat this area again and remove excess wax with a cotton swab and buff again. STEP 5: Repeat when the surface becomes soiled or dull. Excessive waxing may cause too much wax accumulation (tacky surface and dripping). In the past, I’ve used aggressive methods to clean up the exterior of the pipe. These days, I try to preserve as much patina as I can, which means that I wax the meerschaum while smoking it, using white beeswax, instead of resorting to the heroic measures of the artisan. Sanding the block to remove scratches and stains will change the shape of the pipe and it could be years before the patina returns, anytime you disturb the color progression. If there is a buildup of cake on the scorched plateau of the bowl, then scrape the carbon off as best you can without scoring or exposing the surface of the block. 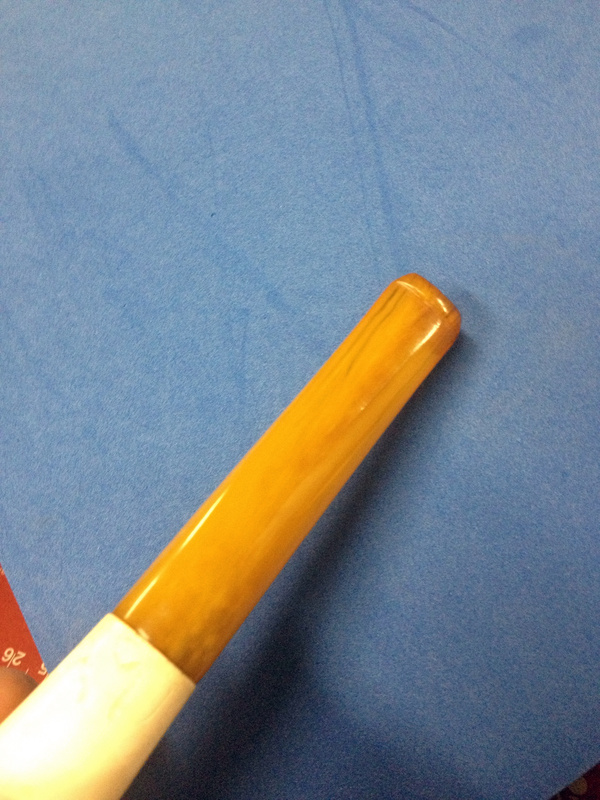 The beeswax will serve to make the black color soften and become more diffuse in time with continued waxing and smoking of the pipe. This is a more conservative approach but I’ve found it to be preferable to waiting years for the coloration to return to the pipe. These pipes will often take a lot of beeswax because they likely have not been waxed since they received it from the carver, which will produce rapid onset of coloration in pipes that have been heavily smoked by others. It is like having the benefits of a professional smoker- a service that the wealthy and nobles have paid for in the past. Here is a bit of history that Ben Rapaport ran across while digging thru the stacks of resources. These days, I’m more selective about the pipes I take in to clean up. If they look like they are going to be a real trial, then I pass on them. There are guys that enjoy working long hours to salvage the pipes that have been abused for decades. I’ve discovered that I’m simply not one of them. The additional cash that I might spend on another pipe that is in better condition is worth it to me. I know my limitations. Some of you already know that dwelling in the realms of the White Goddess can be devastating to your bank account. 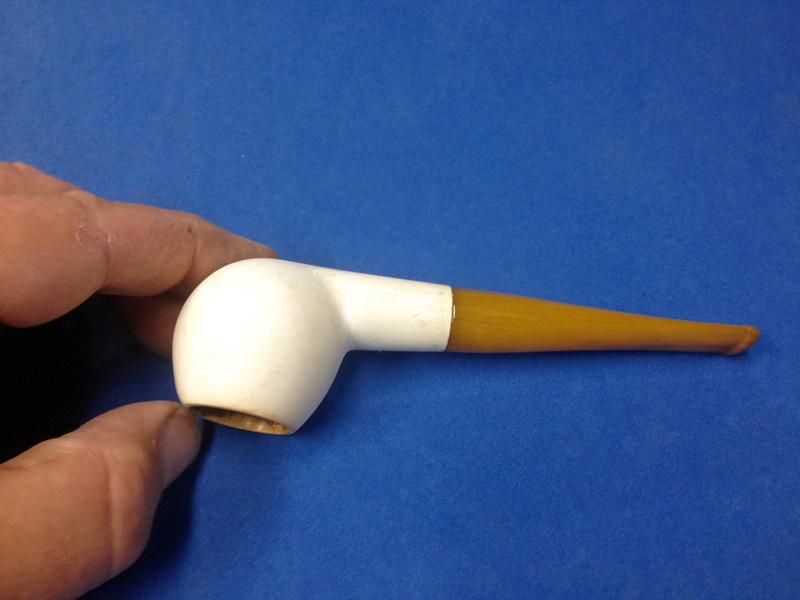 In many ways, the estate meerschaum pipe market offers some degree of respite as long as you think about the hidden costs, such as what it takes to clean these survivors up, and/or repair them. 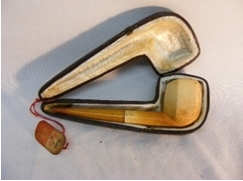 In The Thrill of the Hunt (PipesMagazine.com, 10/19 2010): http://pipesmagazine.com/blog/put-that-in-your-pipe/the-thrill-of-the-hunt-a-guide-to-estate-meerschaums/, I wrote about some of the realities of this market and expanded on it in Time Travelers (PipesMagazine.com, 6/2012). It pays to do the homework before playing with the past glories of this seductive mistress because the rewards can be great. Whether you have found grandfather’s old meerschaum, while rummaging thru the attic, or have acquired the vintage pipe of your dreams from an auction, knowing that returning these old veterans of past fires to active duty will take time is just another of the many lessons in delayed gratification that the White Goddess teaches. Come with me and discover for yourself why these pipes have been so highly prized for the past 300+ years. Care to join me in a smoke? 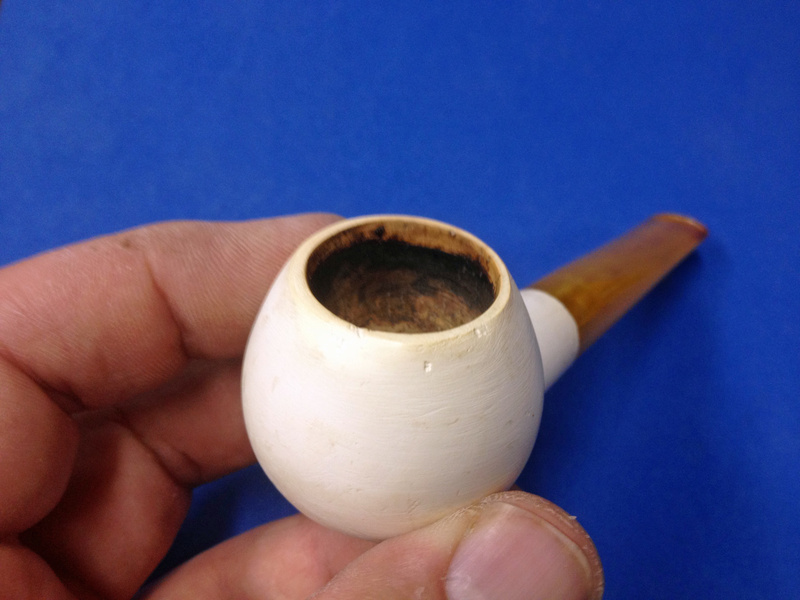 This entry was posted in Pipe Refurbishing Essays and tagged Bowl - refinishing, cleaning meers, cleaning meerschaums, estate meers, Fred Bass, meerschaum, Meerschaum pipes, refurbishing, rewaxing meers on August 1, 2012 by rebornpipes.